In recent weeks I have had several run-ins with anti-missionaries. While I prefer not having such encounters as only rarely does anything good come of them, when they come to me, I have to respond as clearly and firmly as I can in humility and gentleness. Because many anti-missionaries are professional deprogrammers, they can be particularly dangerous to have extended conversations with. So, I’d like to share a few tools to defend yourself, should you or one you know have a similar encounter. But, before I do, I would like to share a few reasons why denying Yeshua and converting to Judaism is counter-productive toward reconciliation and damaging to the restoration of the Kingdom. Because most who know and have relationship with Yeshua were reared in Christianity, most know the seriousness of denying the Messiah. I’ll not delve into His credentials or the reasons we need to maintain our faith in Him from the perspective of personal salvation. Rather, we need to take a look at the importance of maintaining our identity for corporate salvation. Denying Yeshua and converting to Judaism is a violation of Torah by both the one leading the convert toward Judaism and the one being led. Deuteronomy 19:14; 27:17, and Proverbs 22:28; 23:10 all say similarly that we are not to move a neighbor’s boundary marker. One verse even says that he who does is cursed! Further, there are numerous Torah instructions concerning protecting tribal identity and affiliation. Just as we saw in the previous paragraph, Ephraim needs to remain Ephraim and Judah needs to remain Judah. Denying Yeshua is to deny the one who returns us to covenant. Therefore, having been out of covenant and having only one door/means to return, Ephramites remove themselves from the covenant by converting to Judaism because their only avenue back into covenant is through Yeshua. While anti-missionaries would strongly argue this point, the testimony of Scripture is that the one like unto Moses is the only way of return. Conversion to Judaism is not. Following are some tools that will help confirm the person and role of the Messiah as well as give abundant fodder to answer the anti-missionaries. When I first began to understand what it means to walk as Yeshua walked and what it means to keep ‘my commandments,’ I HAD to go back to the foundation of my faith and prove that ‘Moses spoke of me’ and ‘before Abraham was, I am!’ In doing that, I conducted a deep study of the Angel of the Lord who clearly claims all the authority of God Himself, while having human form and interacting physically and visibly with humans. This I turned into a study guide, available here. Later, I found a cool book by Asher Intrater that confirmed and expanded what I had been learning. I recommended the book here with a strong warning about one specific chapter with which I disagree. All told, this is a must read book once convinced of the importance of Torah for all believers. The real beauty of this book is that roughly 120 pages are laid out in a very simple format. The ‘Accusation’ is listed then the ‘Truth’ is spelled out. Most, running less than a page, allow for easy reading and answering of the accusations against Yeshua. In closing, I reiterate, Ephraim must not become Judah, and Judah must not become Ephraim, therefore, conversion by either to the other is NOT beneficial to the restoration of the Kingdom. Doing so short circuits the restoration plan of our Father. In the end, I believe we will all, both Judah and Ephraim, come to a full knowledge of the Messiah and the Torah, but even in that, I believe we will still be recognizable as the individual tribes to which we belong. See Revelation 21:12 and Ezekiel 48. This entry was posted in A Thought... and tagged anti-missionary, antimissionary, Ephraim, First Response Handbook, Judah, Two House theology. Bookmark the permalink. yes I have been joining an anti missionary group in the beginning of 2000 on paltalk to see how the twist goes which they dance…which is actually not to recommend for it really gets dangerous for you if you are not a very strong believer and know how to use your sword. I am thankful Pete that you put some very essentials here together to help us all to overcome such attacks. We will need it. However, even you say it is your best shot, the book of Rabbi Moshe Yoseph Koniuchowsky, I would be very careful with this man too, for he propagates polygamy. I have been in one of his yahoo groups too, so I know. Haven’t red the book you recommend Pete, it might be that good as you say, just want to make sure for us all not to fall for things which aren’t that good uttered by the author, not to take all for granted but prove things if they are so is better. Thank you Pete for sharing! Polygyny is there in the Torah, specifically in the covenant at Sinai (Exodus 20-24). While it makes western people in the 21st century uncomfortable, my suggestion is that if it doesn’t apply to your situation, leave it alone. Since Rabbi Judah ben Gershon’s prohibition circa 1000 AD, it’s not that big of a deal for Judah either. I would be very surprised if the anti-missionaries make it a point of contention, so again, it should not be a point of contention at this time. We have a bigger job – that of reuniting the brotherhood. This is neither the issue here, though I said that same time I was in 2 groups I explained why and that I neither comply with Polygamy thinking of the author of that book Pete mentioned, a measure what is not to weight with in our time. (being aware of that was a less problem then it is for me too now, but that doesn’t mean I agree with it and see it as an possibility now. I don’t see Yahusha either teaching us polygamy.) I didn’t want to make this an issue either in our discussion here, just saying that because the author of the book you rec. has a different view related to Polygamy (and lives ac. that) but also out of other reasons where I have another understanding led to leave that group as well. The antimissionaries group was very educational for me and was the reason to join them for some time to see how they interpret Yah’s word and me to learn how to handle from Scripture better such sorts of arguments they are conflicting. It all comes down to to prove everything and not just agree to everything unproved. So go ahead and read the book and learn from the pieces you can prove alright and leave the rest. I have had the understanding that denying Yeshua means that you no longer believe that Yeshua is Yahweh. Converting to Judaism for this reason seems to be another thing entirely. Or, is it more correct to say that the first is denying the DEITY of Yeshua, and the second is denying that Yeshua is MESSIAH? Dear Amanda, denying Yahusha is Elohim is also denying Him to be Messiah. So it is both. For we have only One Elohim, He is Messiah King , Yahusha is Yahuah in the flesh. Pete, your reasoning and statements on Ezek. 37 regarding the 2 Sticks / nations / kingdoms becoming ‘two’ rather than ‘one’ surely contradicts the entire Message of this chapter? How on earth can you warrant saying “the restored Kingdom has two parts that walk together” when the actual Scriptures clearly stipulate that they will become ONE nation? Ezek. 20:40 “For on my holy Mountain, the high mountain of Israel,’ declares the Sovereign HaShem, ‘there in the land the entire house of Israel will serve Me.”[as one nation]. Ezek. 47: 13 “This is what the Sovereign HaShem says: “These are the boundaries by which you are to divide the land for an inheritance among the twelve tribes of Israel, with two portions for Joseph [Ephraim % Menasheh] 14 You are to divide it equally among them. Because I swore with uplifted hand to give it to your forefathers. This land will become your inheritance.” Where does it infer 2 nations or kingdoms? Is this Restoration Process which we now see playing off right before our eyes not the reverse of the disastrous split of the ONE UNITED Kingdom of Israel of King David and Solomon to restore the re-united Kingdom – ONE 12-Tribed Kingdom? Is that not what the entire Redemption program is all about – that which all Prophecy foretold? Why do those who are called to this Restoration insist on retaining the disastrous 2-Kingdom split which destroyed the ancient Super Power of Israel under Solomon? Why do we resist uniting and ONENESS? Once we realize the importance of having to truly become ONE Nation, then we can tackle the greatly contorted and misunderstood issue of what you term: “Denial of your Messiah”. This is not an anti-missionary issue. Anti-missionaries are there to return Jews to their original Faith. They have no case with non-Jews and who they wish to believe in. It is Ephraim’s stubborn insistence on wanting Jews to accept their Messiah which is causing the problems. Fix that and Oneness may be in reach. Au contraire. I did not twist Scripture, nor did I state that the two remain as two. You twist what I said. Reread the post. Judah insists that becoming one means that Ephraim ceases to be Ephraim and becomes Judah. 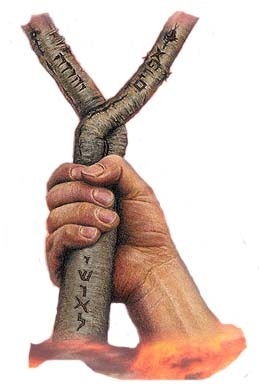 Ezekiel teaches echad, not yachid. Right now, Ephraim, the second kingdom/nation has not even begun to emerge, therefore, we are entirely unprepared to be a stick/kingdom/nation. Until that happens, those who convert to Judaism from Ephraim short circuit the whole process of restoration and undermine the prophecy. Those who aid/abet, rabbis and such, also short circuit the process. b) Hashem makes us echad as Am Yisrael, not Am Yehudah. Now, I refer you to Scripture: the 2 Kingdom split was the will of Hashem (1 Kings 12:15 & 24) and exaccerbated by an overbearing House of David/Judah (1 Kings 12:16 & 19 and 1 Kings 4:7-19). Notice, Judah is not in the list of tribes forced to provide for Shlomo’s extravagance. For all his glory, he was lording it over his northern brothers. Further, the split was caused by Shlomo’s idolatrous activity. (1 Kings 11:31-39) Please don’t blame the Northern Kingdom for the split. Blame Shlomo, Rehoboam and all of Judah who lorded it over their brothers. Ephraim is repenting and returning to Torah, but there will not be peace in the house unless Judah acknowledges their portion in driving Ephraim away and in being overbearing masters, rather than servant-leaders. It is important to focus on God’s redemptive purposes, reconciling humanity first to himself, and then to each other. Thank you for sharing part of this journey.